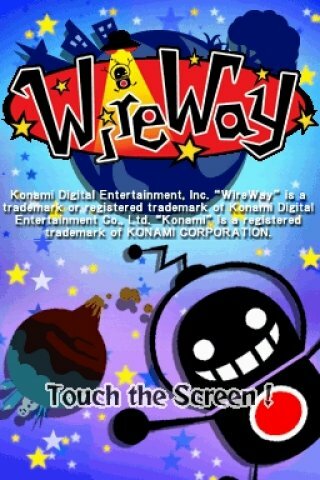 WireWay is a puzzle platformer from Konami that places players in the role of Wiley, an alien who, along with his friend Refresh, wishes to strike it rich on UFObay (clever, Konami) selling Elan, or stars, that he collects on Earth. Elan is apparently invisible to humans, but is worth a tremendous profit to aliens, so Wiley spends his time practicing his WireWay skills, which allow him to slingshot off of black wires collecting said Elan. 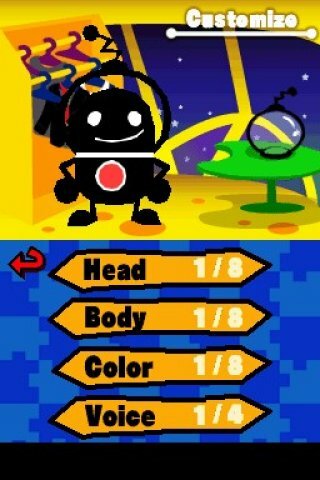 Gameplay takes advantage of the duel-screen layout by placing Wiley at the bottom of a mostly vertical and enclosed area and asking you to slingshot him around the environment collecting stars. The slingshots work as you would expect. 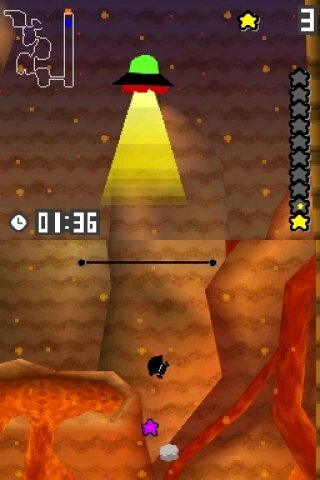 Tap on a wire to grab it, and drag the wire in any direction to be presented with a dotted line showing you Wiley's expected trajectory. The farther you drag away from the wire's starting position, the farther Wiley will go, and vice versa. 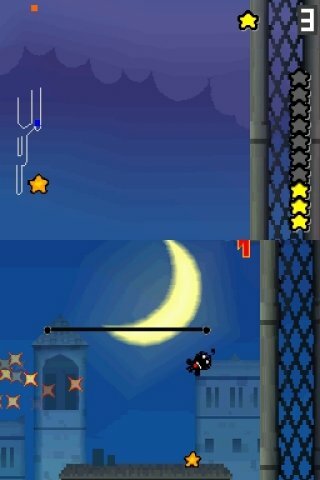 You can also drag Wiley left and right across a wire, allowing you to create a sharper slant on your shots, or can take an even more strategic approach by tapping on Wiley while he is mid flight to extend your jumps, or can, in theory, create a similar effect by dragging a wire into Wiley's flight path if he won't reach said wire on his own. 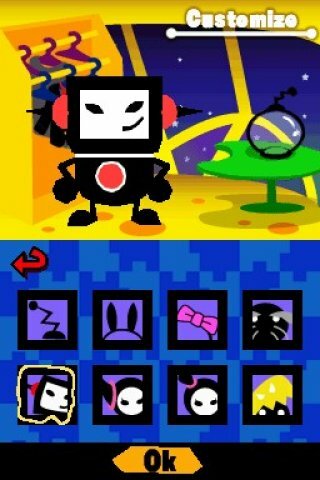 This works simply enough in the beginning few levels, as environments contain only Wiley and wires. 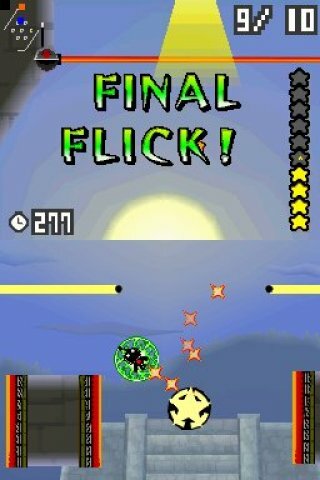 However, enemies and combat do quickly come into play, with bees or floating barbs, as examples, being placed in your path. Enemies can either be avoided, or destroyed if you can slingshot yourself appropriately. Unfortunately, both outcomes occur with equal frequency, as it is almost impossible to see exactly where you're shooting Wiley until it's too late, due to the game's camera. As levels rely heavily on vertical movement, you will often find yourself shooting from the bottom screen to the top, which is fine in theory, but is extremely flawed in practice, after taking into account the huge gap present between the two screens. Instead of starting the image on the top screen at the exact place the image on the bottom stops, your view is allowed to be obscured by the physical distance in between the two screens, creating a substantial blind spot. And this isn't a small complaint, as the gap is so large that whole sections of wire and enemies become hidden within it - it's as if you're shooting Wiley into the abyss. The same can be said for the rest of the game, although not to such a high degree. The camera is zoomed far too close to your character, sometimes blocking the majority of your trajectory, so you'll never know exactly where you'll end up, or if there is a wire waiting for you there, wherever "there" ends up being. After all of that complaining, it should be noted that a mini-map located on the top screen, and arrows placed on the walls of the environment do give you an indication of the general direction you need to be traveling, but this is almost too little too late. 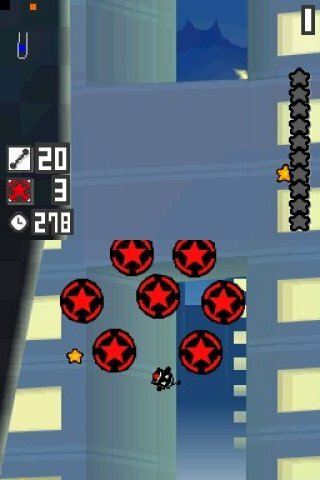 Additional level variety is an appreciated move, with further obstacles like spike strips and bounce strips, along with interactive conveyor belts of sorts adding a fresh take to the levels. However, none of these items can be truly appreciated due to the aforementioned camera issue. 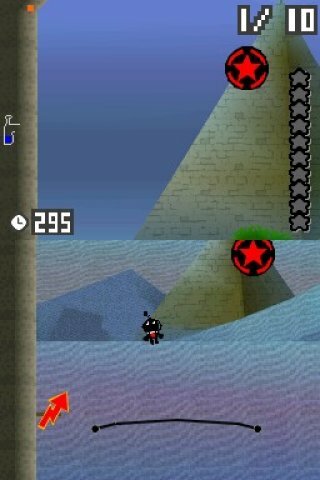 That's not to say the game is unplayable, as eventually you can fling your way through every level, it just takes a lot of patience, and reliance on trial and error which most people may not feel worth dealing with. For those who are up to it, WireWay offers local wireless multiplayer races, but even these come down to more of a luck setup than any real skill. That is, races boil down to little more than "quickly fling the wire and hope he grabs something at the end," but I suppose I can see how this in itself could provide for a bit of humor as you fly randomly around the screen while screaming at nearby friends (of course, it would be funny for all the wrong reasons). It's unfortunate that the game is plagued by such a simple issue, as a zoomed out camera angle could have done wonders for the title. 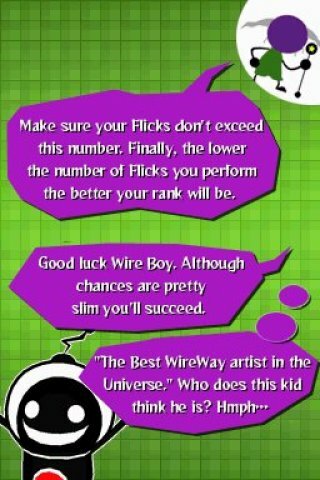 As it stands, WireWay is a clever and humorous little game that had a lot of potential, but the camera is far too much of a hindrance to recommend a purchase. Special thanks to Konami for providing a copy of this title.